Select the project. Currently this is just World War Two and the Napoleonic Wars. Find an appropriate article on WikiPedia which describes the data point in question. Alternatively the user can just select default which will use an appropriate root page. Select a start date and, optionally, an end date for the event in question. Type a brief description of the event (more detail can be found in the WikiPedia link). Determine if the event can be described with a single location, a line (for fronts and borders etc) or a shaded region. Based on the previous type, either type in coordinates or draw on the Google Map. Select appropriate Tags for the data point. 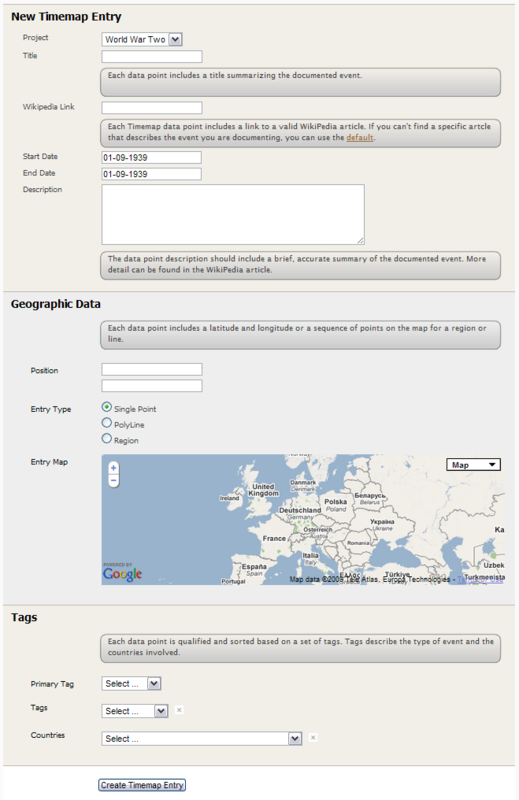 Tags are just identifiers to qualifier and sort data points. The primary tag decides what sort of icon to put on the map (land combat, naval combat etc). The other tags supply more information about the vent. One or more country tags describe which nations were involved in the event. So that is basically it, hopefully pretty straightforward, with the real effort being the research to create a data point in the first place.